Take the N1 North to Pretoria-Pietersburg/Polokwane. 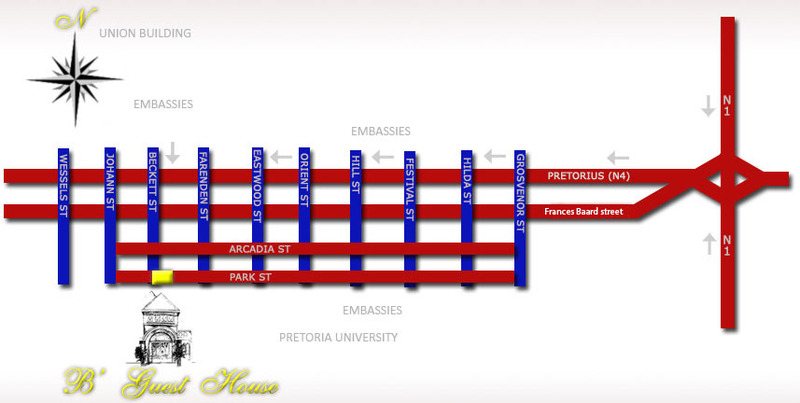 (Take the eastern bypass around Pretoria) Where the N4 Pretoria/Witbank hiway crosses the N1, Turn left to Pretoria. This is a one way street (Pretorius Street). Turn left into Beckett Street. Park Street is at the T-junction. Take the R21 from the Johannesburg Airport to Pretoria. When coming into the Fountains Circle, go 180° around the circle, and take the M3 to Pretoria. Stay in Nelson Mandela drive and follow the Annlin Brooklyn M3 and M5 signage boards, until you get to Schoeman street. Turn right into Schoeman street (one way) M 2 and M 4 to Witbank. Carry on in Schoeman street for 5 blocks and turn Right into Beckett street at the traffic light. Go down Beckett street until you get to the T-Junction in Park street. B’Guest House is situated on the T at 751 Park street.